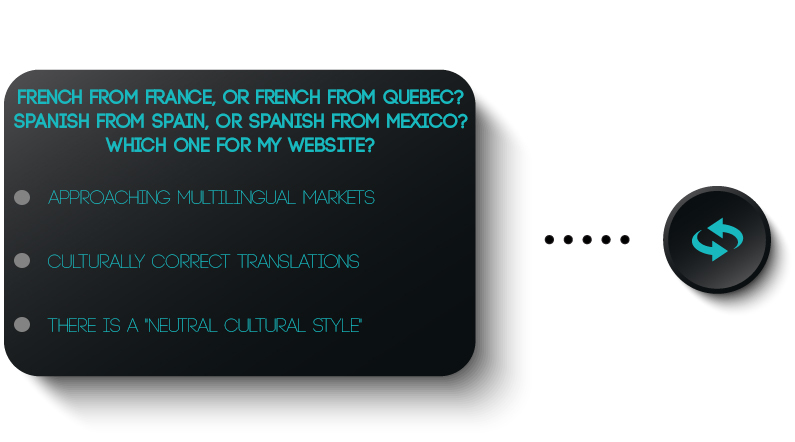 When approaching multilingual markets, it is always important to consider the idiomatic cultural ramifications involved with languages like French, Spanish, Portuguese… Let’s take French, for example (since it is my mother tongue). I have been asked numerous times which one is the most appropriate. It is to be said that, except on a few words that have transcended to different meanings, the grammatically correct French from Quebec is the same as the French from France. I do agree that French can be spoken and written differently depending on regions (Quebec, Polynesia, Africa, etc.). However, if you free the text of a website from any form of colloquialism, the French from France will be the only proper French which can be used as a cultural common denominator when targeting all French-speaking communities worldwide. It is obvious that if someone only wanted to target the Mexican market, it would be better to work with Mexican translators. If someone wanted to reach Portugal, it would be better to find a Portuguese translator than a translation professional from Brazil. However, when it comes to Spanish and Portuguese, there is a way to phrase a translation using a “neutral cultural style” which will be accepted by all communities worldwide where such language is spoken. Even on a smaller scale, the German spoken in Berlin is significantly different from the one used in Zurich… Once again, there is a grammatically correct neutral ground of writing German. A good translation always aims at being culturally correct. In my years of experience working with translators around the world, I can only say that experience makes the difference!! And, in most cases, a strong education base contributes greatly to top level performances. I have worked with Portuguese translators from Portugal who could write like qualified native copywriters from Brazil. I have worked with someone in Beijing who could indifferently write in Simplified or Traditional Chinese without anyone ever suspecting his origins. Translators with such cultural polyvalance are “far and few between”, and I always advise a strong screening process when electing to work with a new translator. I do believe that when considering French, Spanish, Portuguese or German, a translator should have the ability to write in the neutral cultural style, thus not revealing his/her origins unless the cultural emphasis has been applied strategically for marketing purposes. One more thing: I would like to add that between the French from Quebec and the one spoken in France, most of the differences are noticeable when spoken – different accents, colloquials, neologisms, etc. However, contrary to general belief in the US, the way someone educated writes French in Montreal is 98% similar to the French written in Paris. To conclude, when choosing your translator, ask for extensive references and analyze your global markets meticulously prior to making a decision as per who will develop your multilingual applications.